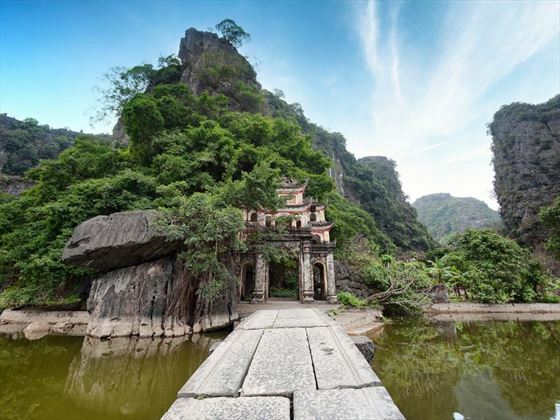 Take in the very best of Vietnam on this captivating ten day luxury tour. 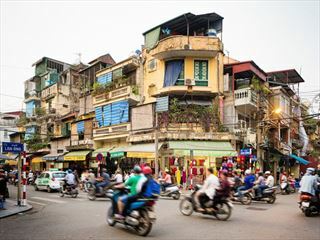 You’ll journey from Hanoi in the north all the way down to Saigon in the south with a private English-speaking guide with every step of the way. This tour can be completely tailor made to your requirements, chat to one of our friendly team for advice and recommendations. This is a tour for the discerning traveller who likes to travel in style – you’ll stay in exceptional hotels including five star resorts and charming boutique hideaways as you explore the magnificence of Vietnam. 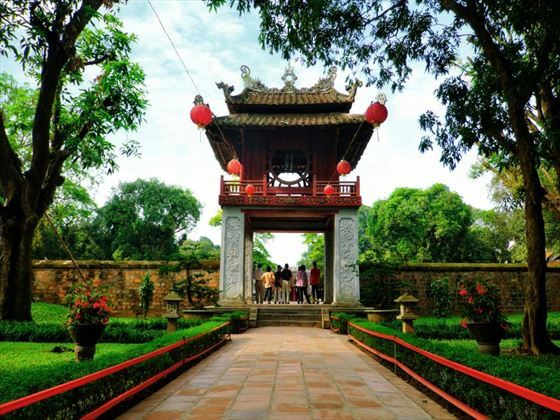 You’ll have a private English-speaking tour guide with you every step of the way too; their knowledge of Vietnam is second to none meaning you’ll enjoy a truly rich experience learning about the history and culture of the country as well as seeing the hidden gems tourists often miss. With fascinating excursions in store including a food tour of Hanoi and explorations on the Tam Coc River in a traditional sampan boat, your trails in northern Vietnam will be stunned with sensory experiences and stunning beauty. But nothing matches the UNESCO world heritage site of Halong Bay, where you’ll spend a night cruising in a deluxe Junk boat. As you head south you’ll explore the ancient city of Hue and get to know the markets and streets of Saigon before heading out on a boat expedition on the famous Mekong River. The whole trip will be in complete comfort with luxurious hotels and high quality boat accommodation. You’ll have the chance to see the amazing sights of Vietnam on your own terms (EX). Today you’ll arrive into Hanoi’s Noi Bai Airport where you’ll be met by your guide and will be then be privately transferred to the hotel in the city. The rest of your day is free to explore the city at leisure or simply relax in your room. After a light breakfast at the hotel you’ll head out into the city for an insider food tour of Vietnam’s capital – don’t worry about stuffing yourself at breakfast, there’s plenty of food on offer! You’ll be shown around by a local food blogger who is a real expert in the Hanoi food scene – his work is trusted by locals and has been used in the international media as well. You’ll be met at the hotel with by your private guide and food tour guide where you’ll be driven to the heart of the city. You’ll take a walk through the historic Old Quarter before reaching Thanh Ha market. Here you’ll be guided through the huge range of delicacies, foodstuffs and cooking practices of Vietnam. The market is a vibrant introduction to life in Vietnam offering a real taste of what it’s like to live in Hanoi. You’ll continue your journey to Dong Xuan market where you’ll get the chance to sample tasty local dishes including the legendary pho and other spiced noodle snacks. The food guide will talk you through the different Vietnamese meal times and the fascinating ingredients used here. You’ll walk up the famous ‘food alley’ and get a good look at all the amazing treats on offer. Next up is another of Hanoi’s markets, Dong Xuan, the largest in the city. Here you’ll learn about bartering for spices and other goods before moving on Hang Than Street were you’ll find French-influenced desserts and cakes. You’ll finish your tour with a walk through Phung Hung Street and then a visit to a tiny coffee shop in the Old Quarter. 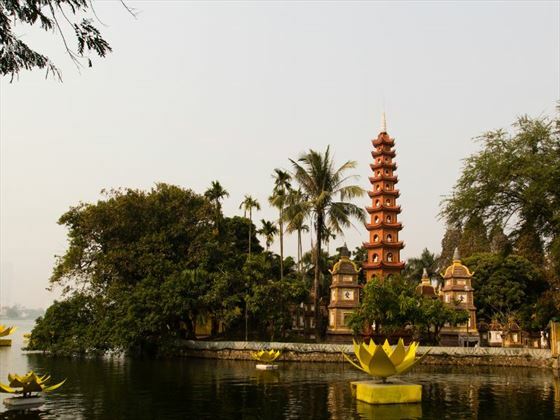 In the afternoon you’ll visit West Lake where you can see Tran Quoc, which is one of the oldest Buddhist pagodas in the city. You’ll then head on to the Taoist temple of Quan Thanh which dates back to the Ly Dynasty. The rest of the day is free for you to explore Hanoi at your own pace. Today you’ll leave your hotel in Hanoi and travel to the ancient city of Hoa Lu, which served as the capital of Vietnam during the 10th and 11th centuries. 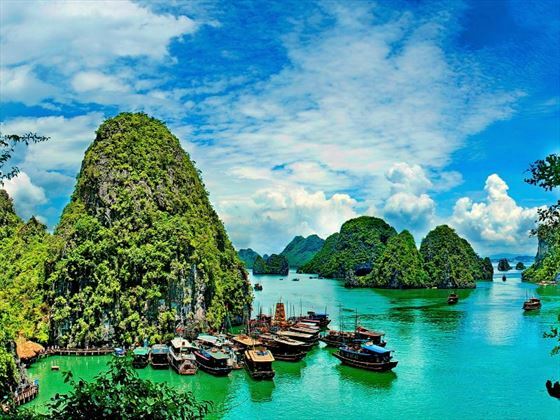 You’ll then take a sampan boat down the Tam Coc River, renowned for its charming scenery and limestone karsts akin to those found in Halong Bay. If you’ve got the time, you can take a half-an-hour walk up one of the karst hills which offers spectacular views. Later on you’ll have a traditional Vietnamese lunch in Tam Coc Town before heading back on your private sampan to either Thung Nang (in the summer) or Trang An (in the winter). Finally you’ll have the chance to climb the Bich Dong Pagoda. Stay the night in Ninh Binh. 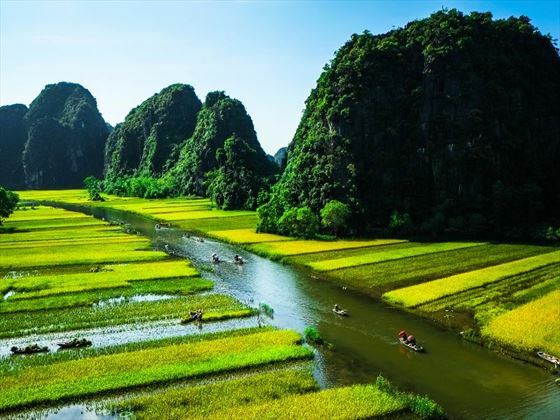 After breakfast at the hotel you’ll head to Halong Bay journeying through rice paddies, farmlands and working villages. When you arrive in Halong City in the late morning you’ll board a traditional Vietnamese junk boat and set sail on the bay. You’ll have lunch on board as the boat makes its way between the awe-inspiring limestone karsts. Rest up and enjoy the wonderful views before dinner, served when the boat sets anchor for the night. You’ll then get a night’s sleep on board the boat. Today you’ll sail back to Halong City through the bay, enjoying a relaxed and tasty brunch. Back on land you’ll meet your driver who will take you to Hai Phong Airport and you’ll catch a flight to Danang. When you arrive you’ll be met by your guide and be driven to Hoi An where you’ll spend the night. After breakfast you’ll be driven in to the centre of Hoi An where you’ll take a fascinating walking tour through the town. You’ll have lunch in a great restaurant serving a unique fusion of Vietnamese, Japanese and Latin American cuisine. After a fantastic meal you’ll leave for Hue, the former imperial capital. Along the way you’ll visit the Cham Museum and walk up to the top of Hai Van Pass for stunning views. You’ll eventually arrive in Hue in the late afternoon and transfer to your hotel. Today is a full day exploring the beautiful city of Hue. You’ll be picked up from the hotel in a cyclo and you’ll head to the Old City, where you’ll find Tinh Tam Lake, a favourite spot amongst the old Vietnamese nobility. Here you can visit a local-style coffee shop, frequented by university students. You’ll then head onwards to Tay Loc Market by cyclo. Not often visited by tourists, this market gives you the chance to observe life in Vietnam as it naturally occurs as you watch locals bartering and trading. Afterwards you’ll transfer to the pagoda at the heart of the city before visiting the skilfully restored An Dinh Palace to see the wonderful murals. After the tour you’ll have lunch at the fantastic Ancient Hue restaurant, which serves classic Vietnamese dishes. 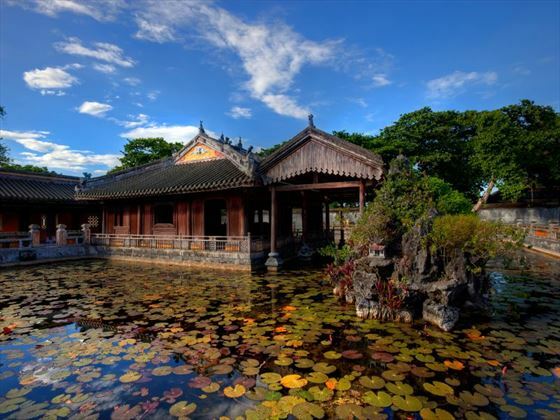 Then you’ll head on to the tombs of Minh Mang and Khai Dinh before returning having dinner in one of Hue’s gorgeous garden houses. 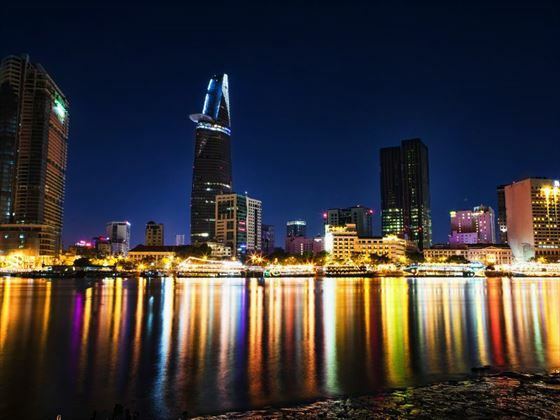 Today you’ll have breakfast at the hotel and then be transferred to the airport for the short flight to Ho Chi Minh City, still known to most as Saigon. You’ll be driven around on a Vespa scooter exploring the city and taking in the sights. Have a tasty local lunch and then head to see the monument of Thich Quang Duc before visiting the Ho Thi Ky flower market. Continue your tour of the city with a trip to Nhi Phu Temple before exploring Chinese medicine shops and traditional Vietnamese tailors. Visit a busy local market then take in the famous post office and the Cathedral of Notre Dame as well as a range of other sights. You’ll have a Vietnamese fusion lunch offering truly unique tastes and experiences, then in the afternoon head on foot through the streets of the oldest quarter. Here you’ll take in Antiques Street and look at the range of genuine and (still impressive) fakes on offer. Finish your tour with a trip through the Beaux-Arts Museum. The rest of your evening is at leisure. After having breakfast at the hotel you’ll travel through the pretty Vietnamese countryside until you reach the fabled Mekong River. 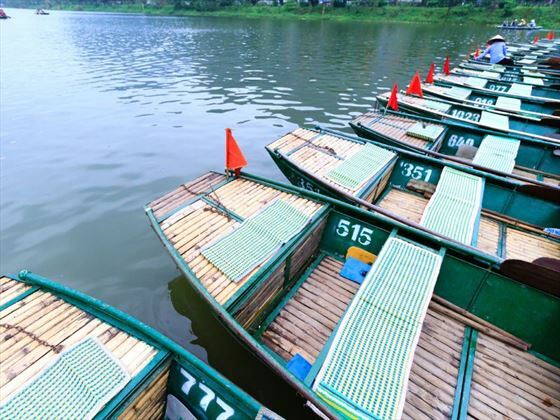 You’ll board the Victoria, a boat modelled on a traditional sampan. The boat is highly comfortable but its small size allows it to easily navigate through smaller canals and waterways often missed. You’ll travel on the river to Can Tho, visiting temples and other sites along the way. You’ll have dinner on board the boat and then moor for the night. After breakfast on the boat you’ll visit Cai Rang Floating Market. You’ll then return to land and be transferred back to Saigon’s airport for your flight home. Fuel your teenagers' fascination for the world with this exhilarating and cultural eight-night tour through Vietnam. 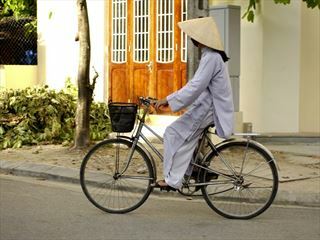 Cycling through the countryside, exploring Hoi An - there's plenty to excite the whole family.